A PIONEER IN CNC MACHINE TOOLS: THE STORY OF HWACHEON - Hwacheon Asia Pacific Pte. Ltd.
How does it feel to be 67 years of age? For some, it could be the age of retirement – or a new lease of life. For others, it may mean becoming a happy grandparent. At Hwacheon Machine Tools, we celebrate our 67 th anniversary in May 2019 by continuing to do what we do best – create, manufacture, deliver and install high quality CNC machine tools for thousands of clients around the globe. In doing so, we work hard to bring smiles of delight and satisfaction to the faces of the engineers, machine operators, factory managers and business owners who work with our machine tools every single day. In this article, you’ll retrace the unique history of Hwacheon Machine Tools. 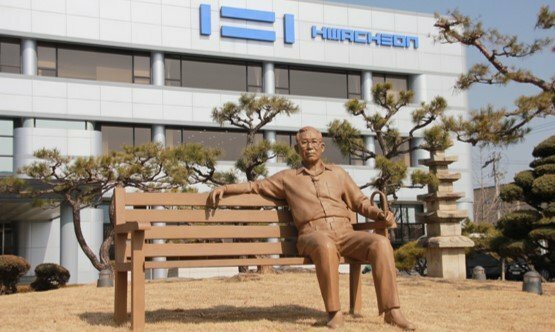 Learn how Hwacheon’s late founder Kwon Seung Gwan turned a humble foundry in Gwangju into one of Korea’s foremost machine tool makers, with a global presence in US, Europe and Asia. The genesis for Hwacheon Machine Tools was seeded in our late founder and honorary chairman Mr Kwon Seung Gwan’s (1916-2004) youth. Growing up during the harsh and tumultuous periods of World War II followed by the Korean War, Kwon started work in his teens. An apprentice mold maker in a local foundry, he worked hard to contribute to his family’s livelihood. His grit, determination and attention to quality earned him the confidence and respect of the owner, who entrusted Kwon with stewardship of his foundry in August 1945. The company was later established as the foundation of Hwacheon Group on 20 December 1945. First known as ‘Hwacheon Machine Works’ in the Gung-dong township in the city of Gwangju, Kwon incorporated Hwacheon Machine Tools Co. Ltd. on 26 May 1952. Hwacheon’s development paralleled South Korea’s progress as an industrial and engineering powerhouse during those early years. One of the Hwacheon’s initial challenges in 1952 was to build a manual lathe. By designing & building the first lathe in Korea, Kwon played a key role empowering Korea’s fledgling manufacturing sector. Kwon built on his success later in 1959 with the development of Korea’s first direct-coupled belt-driven lathe. 5 years later in 1964, Hwacheon added a feather on our cap with the development of the country’s first gear-driven automatic lathe. In the 1970s to 1990s, Hwacheon focused our energies on researching and developing technologies in product advancement and systematization. A rapidly growing machine tool maker, Hwacheon further established its own manufacturing division. 1983: Developed Korea’s first NC Milling Machine (VN-85K); first CNC copy milling machine (COPMIL-600); and first NC 4-axis lathe (ECOSTAR-3). 1987: Developed Korea’s first horizontal machining center (a multiplex machine tool with automatic tool changer). Through our own foundry, we produce premium raw materials and casting materials perfected over half a century. From high-quality gears, chucks and curvic couplings, our experience helps us achieve global standards. We produce and supply high-tech machine tools praised by clients for their precision, durability and smart use of technology. Supplying Korea’s first agile factory automation facilities, we customise our solutions to meet individual client demands. Internationally certified for our quality, Hwacheon machines the main parts of car engines – cylinder blocks, cylinder heads, and crankshafts. Building on our strong foundation in engineering and machine tool technology, Hwacheon Machine Tools will continue to research and invest in smart machining techniques and automation solutions well into the future. Our goal is to be a customer-driven company that provides a top-notch and dependable machining solutions for our customers. We hope that you enjoyed learning about the Hwacheon story. Honed over 6 decades, our experience and future-ready capabilities makes us your ideal partner. Here’s why. As an enabler of Korea’s success and industrial powerhouse, Hwacheon designed and built Korea’s first NC lathe and developed its first CNC milling machine and horizontal machining centers. Forged in the furnaces of experience and experimentation, we offer uncompromising products that provide the highest quality and reliability in the industry. Passionate and undaunted by challenges, Hwacheon’s R&D center has accumulated over half a century of expertise in machine tool technology. The performance and productivity of Hwacheon’s CNC machine tools hinges on the quality of our mechanical design, performance of our spindles, and support by Hwacheon’s software technologies. As a company focused purely on machining, we can support our customers in all aspects of their machining process. With sales offices and service outlets around the globe, Hwacheon’s local presence is felt in more than 30 countries. Committed to a long and stable partnership, Hwacheon pays close attention to its customers feedback. By doing so, we continually improve and provide the best solutions in the industry. Sign up for the latest machine releases, product updates,industry news and event highlights.